For someone who is regarded as a terrible free throw shooter and doesn't have any post moves, this latest news from Dwight Howard sounds hilarious. The Atlanta Hawks big man revealed that he plans to start shooting 3-pointers more next season, as he wants to expand his game. Howard, who is 5-of-56 from 3-point range in his career, says he has been working on them so far this offseason. 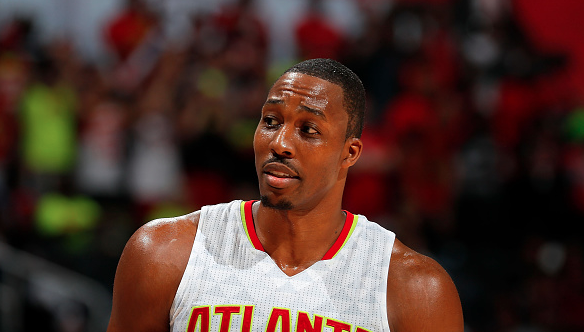 “I’ve been working on my 3’s, really trying to add some range to my game,” Howard said. “Which is going to be weird for people to see, I guess. They are used to seeing me in the paint battling. But in order for me to play longer, I have to expand my game. The game is not just back to the basket, get the ball in the post and go to work. It’s more stepping away from the basket, setting screens, popping, shooting 3’s and stuff like that. People haven’t seen me do that. It’s going to be an adjustment for me, but also the fans. I think it’s going to be fun." I don't blame Howard for doing this, but it will be funny to see. With guys like Hassan Whiteside planning to expand to the 3-ball, it only makes sense for Howard. I wonder who's next, DeAndre Jordan?